David Meissner on "Call of the Klondike" - The 2014 Golden Kite Award For Nonfiction Interview ...And your chance to WIN a copy! This year's Golden Kite Award for Nonfiction goes to David Meissner, for his middle grade title, "Call of the Klondike!" Lee: Can you tell us about finding out you'd won the 2014 Golden Kite Award for nonfiction for "Call of the Klondike?" David: I was in France for work and opened my email after a long day to discover the wonderful news. It was no doubt a great thrill, honor, and surprise. Lee: Your book is packed with reproductions of primary source materials - photos, telegrams, newspaper articles, even letters written on the back of envelopes! What was the process of organizing and choosing the ones that would make it in the book, from what must have been a sea of material? David: It was definitely a sea of material! The first step was to cull through everything we had in order to find the arc of the story. Kim Richardson sent me a long Word document with all of the correspondence from his relative, Stanley Pearce. Even though Kim had already done much of the hard work by deciphering old handwriting and typing it up, the amount of material was no doubt intimidating. I read through Pearce’s writing multiple times and highlighted key portions. While fascinating, it still didn’t seem like the story was complete. Pearce wrote long, descriptive letters and articles, but there were big gaps of time without any information. I soon discovered that Marshall Bond had written a daily diary during their adventure and that it was in the special collections library at Yale. That was the key. Once I went through Bond’s diary and other writings, I could finally see the full story. Bond’s daily updates filled in the gaps. The next challenge was the more tangible, though still tedious task, of selecting the best writing, editing out redundancies, and doing external research for additional photos and material. Lee: In addition to attending #LA14SCBWI - The 2014 SCBWI Summer Conference - to accept your Golden Kite Award, you'll also be on faculty, giving the Sunday breakout session "Digging Deeper: How Authentic Research Leads To Authentic Writing." Can you tell us more about that workshop? David: This workshop will focus on how to conduct authentic research before and during the writing process. While writing Call of the Klondike, I realized how vital it is to truly understand your subject. Having this larger context translates into more confident writing with richer detail and greater authenticity. Lee: Kim Richardson, the great-great-nephew of Stanley Pearce, one of the two gold rush stampeders the book follows, is credited as co-author. How did the two of you collaborate on this? David: Kim was the visionary behind this book. Ten years before we discussed the project, Kim had already typed up the century-old letters, articles, and telegrams that had been passed down to him through relatives. Over the course of a decade, he had approached publishers, editors, and writers. Ultimately, he found a talented, experienced, and interested editor in Carolyn P. Yoder, who had her own American history imprint, Calkins Creek, at Boys Mills Press. Carolyn and Kim had initially looked for an expert on the Klondike Gold Rush to write the book, but weren’t able to find an expert who could also shape this material into a book for young people. When I was living in New York, Kim came to town and told me about his book idea over dinner one night. A few days later, he emailed to ask if I wanted to write the book. He started by emailing me all of the typed correspondence and telling me everything he knew about Pearce and Bond’s adventure. Kim made it clear that he was not a children’s book author and that he would provide general guidance, support, and feedback. He also followed through on many details relating to photo research and Pearce’s writings. Kim was amazingly gracious in allowing me the freedom to shape this material that was so dear to him. Whenever I got stuck, had questions, or needed some clarity or moral support, Kim was just a trans-Atlantic Skype away. Lee: Why the Klondike Gold Rush? What made this the story you wanted to tell? David: During middle school and high school, I learned about gold rushes superficially and they never really interested me. That sentiment continued into adulthood. It was only when I read Pearce and Bond’s first-hand writings that this gold rush came to life. This makes me think that we need to spend more time personalizing history and less time memorizing generic facts and dates. As a teacher and learner, I definitely prefer depth over breadth. As I wrote in the Author’s Note, I now find the Klondike Gold Rush absolutely fascinating. If you ask me about it, I will talk your ear off. Lee: In the author's note, you explain about going to Alaska and Canada in 2010 to re-trace the steps of the Klondike Gold Rush stampeders, including hiking the famous Chilkoot Trail. How did that personal experience change your approach to the manuscript? David: I could have written Call of the Klondike without taking that trip, but the book would have been missing something. By traveling to Alaska and Canada, I was able to experience the landscape and gain a first-hand understanding of the geography of the trail, which allowed me to write about the context with greater confidence. Through that trip, I also met with experts, visited museums, dug through archives, and learned more about the gold rush than I ever could have through books and online research. I also found historical photographs and took a number of photos myself that we used in the book. Two of the experts I met ended up providing invaluable feedback on the final draft. That research trip took this book to a higher level and I thank Kent Brown, head of Boyds Mills Press at the time, for understanding this and funding the trip. Lee: There are two teachers guides available on your website for "Call of the Klondike" - how important is it to have a teacher guide for a nonfiction book for young readers? David: As a teacher myself, I know how nice it is to come across a book or curriculum that has clear and thoughtful suggestions for engaging students, while still allowing room for the teacher to customize the learning process. Boyds Mills Press developed a guide relating to the Common Core. My guide includes discussion questions by chapter as well as ideas for pairing the book with The Call of the Wild. Both are free and available for download at www.bydavidmeissner.com. Lee: When did you first join SCBWI, and can you share how that's helped you on your journey as an author? 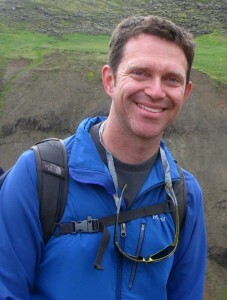 David: I believe that I first joined SCBWI in 2002, just after I decided I wanted to write children’s books. I went to the summer conference in L.A. and then the winter conference in New York a few years later. I found it amazing that an organization like SCBWI existed⎯one that provided a forum for well-known professionals and aspiring writers to mingle, connect, and elevate the quality of children’s literature through collaboration. Attending workshops, reading the bulletins, and meeting others in the field helped improve my writing and better understand the realities of the publishing industry. It’ll be fun to return to L.A. to lead a workshop for fellow writers. Lee: What advice do you have for other writers working on nonfiction projects? David: Researching and writing a nonfiction book is so much work that you must be fascinated by and passionate about the topic. Thoughts of book sales, fame, and private yachts will not be enough fuel to propel you through the challenging times. 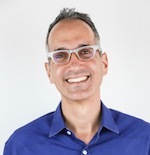 If you'd like to learn from, listen to and cheer David on as he receives his 2014 Golden Kite Award for Nonfiction, join us at the upcoming SCBWI Summer Conference, August 1-4 in Los Angeles, CA. To find out more about David and "Call of the Klondike," visit his website here. 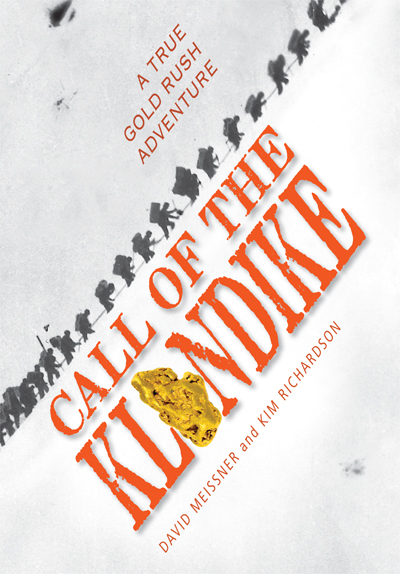 Would you like to win a free copy of "Call of the Klondike?" Leave a comment here on this post in the next seven days, and we'll randomly choose one winner! When is a character a character? Sherlock Holmes, the creation of Sir Arthur Conan Doyle, might call it "Elementary," but whether or not a character is fully formed in their first appearance or only once their original author has finished telling all the stories about them (and thus made them "more round") was recently in court. The 7th Circuit Court of Appeals upheld a 2013 lower court ruling holding that 46 Sherlock Holmes stories and four novels created by Arthur Conan Doyle before 1923, along with the signature characters in those books such as Holmes and Dr. Watson, are in the public domain. 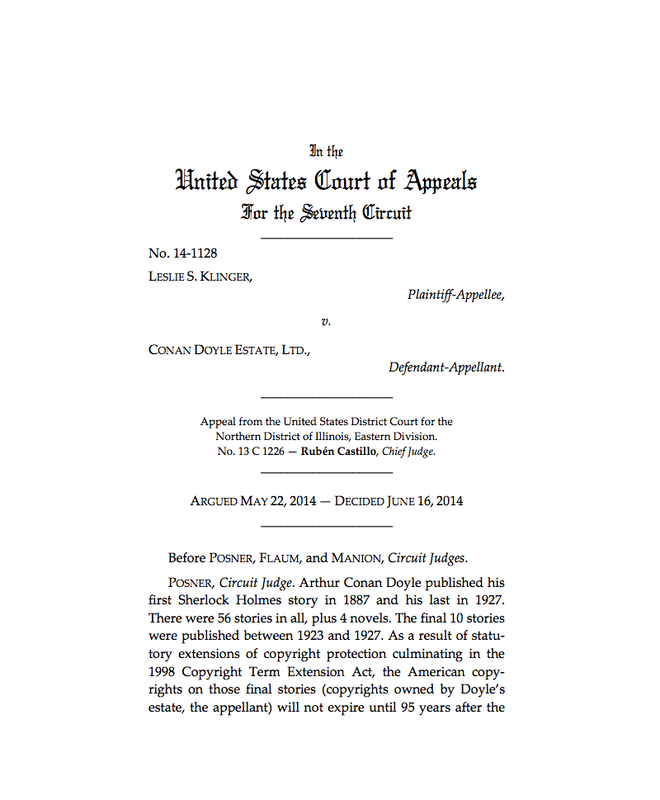 In the appeal ruling, written by Judge Richard A. Posner, the issue was once more whether copyright should continue to apply because of 10 additional Sherlock Holmes stories published after 1923 that made the characters "more round." Posner rejected that notion outright: "Flat characters thus don't evolve. Round characters do; Holmes and Watson, the estate argues, were not fully rounded off until the last story written by Doyle. What this has to do with copyright law eludes us." The ruling added: "it appears that the Doyle estate is concerned not with specific alterations in the depiction of Holmes or Watson in Holmes-Watson stories written by authors other than Arthur Conan Doyle, but with any such story that is published without payment to the estate of a licensing fee." It's a fascinating judgement, that you can read here. 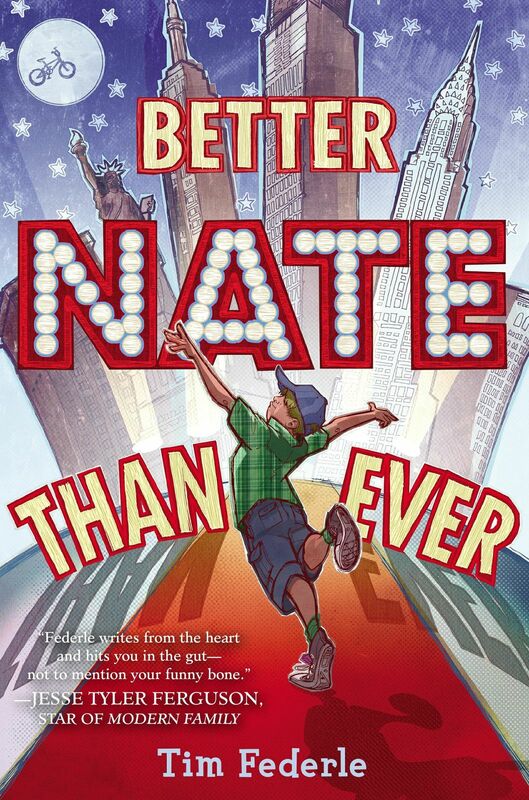 Tim Federle on "Better NATE Than Ever!" - The 2014 Golden Kite Award for Fiction Interview ...And your chance to WIN a copy! 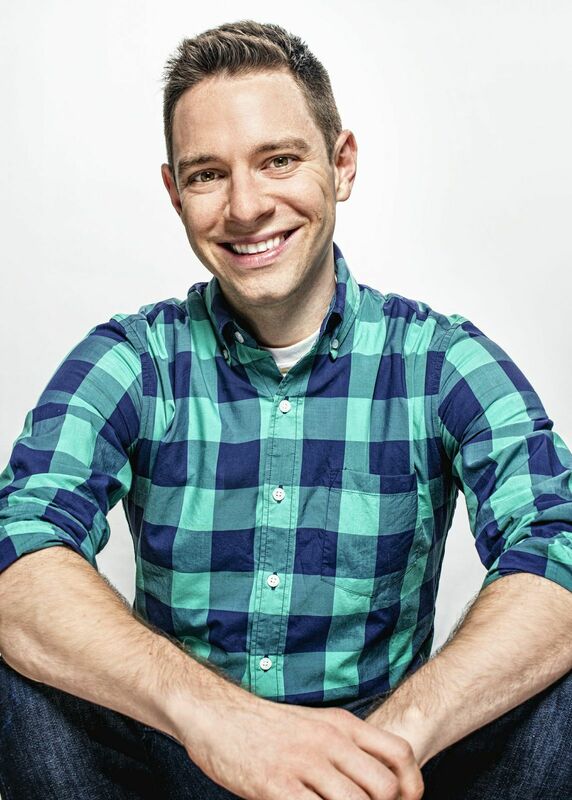 This year's Golden Kite Award for fiction goes to Tim Federle, for his middle grade novel "Better NATE Than Ever!" Lee: Hi Tim - congratulations! Can you tell us about finding out you'd won the 2014 Golden Kite Award for fiction for "Better Nate Than Ever?" Tim: I was at a Texas high school for the performing arts, about to give a presentation on books and Broadway for several hundred kids. Lin Oliver and Steven Mooser phoned me up and I believe I screamed and then hung up and walked out onstage with shaky legs. But it's a blur. Lee: Your bio describes you as "raised in character-building Pittsburgh" and says you "fled to New York City as a teenager." That's sounding a lot like Nate's journey, escaping a small-minded town and fleeing to Broadway... It's classified as fiction, but how much of Nate is you? Tim: Aren't all first novels semi-to-majorly autobiographical? There is a lot of Nate and Tim overlap, though Nate's family isn't as supportive of his wacky ambitions as mine was in real life. Lee: In addition to attending #LA14SCBWI - The 2014 SCBWI Summer Conference - to accept your Golden Kite Award, you'll also be on faculty, giving the breakout session "The 10 Things Nobody Tells You About Being A Debut Novelist." Can you tell us more about that workshop? Tim: Yes! It's going to be a (hopefully) fun and funny and frank discussion about all the surprises and occasional setbacks that I hit as a very naive new writer. My goal is to inspire and inform other SCBWI members with some practical tips and tools. Lee: How are you dealing with the challenge of constantly switching gears between winning awards for and talking about "Better Nate Than Ever" and promoting the book's sequel, "Five, Six, Seven, Nate!" which came out this January? Tim: It's a good problem to have. I'm also adapting the first "Nate" book into a screenplay and working on a followup to my cocktail recipe book, "Tequila Mockingbird." I either sleep 2 hours a night or 10. But no complaints. Lee: Your background as a broadway dancer (and auditioner) is palpable in the book's audition scenes where there's such a crazy power-disparity between the people in charge and the people there to audition. Was there a bit of 'revenge of the writer' now that in telling the story, you got to be in charge of it all? Tim: The greatest thing about writing -- especially novels -- is that you get to be the casting director, set designer, and all the actors, too. So it was fun to borrow and heighten from scenes in my own life, going back to my early days as a dancing polar bear in the Radio City Christmas Show. I always tell kids at my visits: wait long enough and every setback you have in life can be used as a plot point in your book, someday! Lee: I like that - it reminds me of that T-shirt that reads, "Careful or you'll end up in my novel." There are so many funny moments, but also a lot of heart in this book - like the relationship between Nate and his best friend, Libby, and between Nate's Mom and her sister, Nate's aunt. Tell us about finding that balance. Tim: I have an incredibly limited attention span, so I'm trying to keep my own self awake and entertained when writing. With that said: it can be a challenge for kids to access books without a parent/librarian/educator's endorsement, so I always try to write with an ear for keeping those gatekeeper adults entertained too. Lee: At one point, Nate experiences all these emotions on seeing two men dancing together in the big city. It's one of a number of not-quite-coming-out moments for him, and yet, it all adds up to a kid who's figuring out that there just may be a place for him, and for boys who dance with other boys, in our world. Can you share about how you handled Nate's being gay? Tim: I have a post-it note above my desk that says "Tell the truth." My whole life, I've relied on jokes and sarcasm and punch lines to get out of everything from gym class to parking tickets. And so as much as I hope people laugh during the "Nate" books, I also pushed myself to tell the truth about what it was like for me to be a 13-year-old boy who was starting to notice other boys. Which isn't always funny, believe me. I tried to write about that in a way that was age-appropriate for my middle school audience but that wouldn't overwhelm the story with "message." Lee: And in the sequel, there's a boy-boy kiss, right? Tim: I joined SCBWI right after "Nate" sold, a couple of summers ago. There is a gigantic sense of relief knowing there are thousands and thousands of other writers and illustrators out there who are psychically linked by this incredible organization. Also, the magazine is really pretty. SCBWI helped me with everything from practical articles on taxes to a deep sense of belonging. Lee: What advice do you have for other writers working on their novels for young readers? Tim: Enjoy every step, and celebrate each of them too. You may end up cutting entire chapters and characters, but that doesn't mean you shouldn't say a little prayer of thanks when you first encounter them in your first drafts. Also, read "Tiny Beautiful Things" by Cheryl Strayed and "Bird by Bird" by Anne Lamott. We're all in this together. If you'd like to learn from, listen to and cheer Tim on as he receives his 2014 Golden Kite Award for Fiction, join us at the upcoming SCBWI Summer Conference, August 1-4 in Los Angeles, CA. And to find out more about Tim and all his books, visit his website here. Would you like to win a free copy of "Better Nate Than Ever?" Hollywood's films for young people have three male characters for every one female character - And what we can do about it. "...for every one female-speaking character in family-rated films (G, PG and PG-13), there are roughly three male characters; that crowd and group scenes in these films -- live action and animated -- contain only 17 percent female characters; and that the ratio of male-female characters has been exactly the same since 1946." Consider those numbers, in contrast to the US Census bureau report that 50.8% of the population are "female persons." "Throw in the hypersexualization of many of the female characters that are there, even in G-rated movies, and their lack of occupations and aspirations and you get the picture." "Go through the projects you're already working on and change a bunch of the characters' first names to women's names. With one stroke you've created some colorful, unstereotypical female characters that might turn out to be even more interesting now that they've had a gender switch. What if the plumber or pilot or construction foreman is a woman? What if the taxi driver or the scheming politician is a woman? What if both police officers that arrive on the scene are women - and it's not a big deal? With all the synergy and border-crossing between movies and books and apps, Geena's point -- and advice -- is well worth considering! 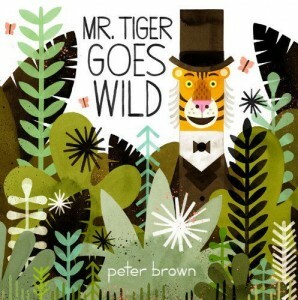 Peter Brown on "Mr. Tiger Goes Wild" - The 2014 Golden Kite Interviews ...And Your Chance To Win A Copy! The 2014 Winner of the Golden Kite for Illustration is Peter Brown for his "Mr. Tiger Goes Wild!" Watch this before reading the great interview with Peter below! Author and Illustrator Peter Brown On His Process from School Library Journal on Vimeo. Lee: Congratulations, Peter! Can you tell us about finding out you'd won the 2014 Golden Kite Award for picture book illustration for "Mr. Tiger Goes Wild”? Peter: Well, it started with a game of phone tag. Lin Oliver and Stephen Mooser were trying to get me on the phone, but I was super busy that week. Lin left me a mysterious and giddy voicemail, and I still had no idea what was going on. We finally connected and they told me the great news. Of course I was surprised and thrilled! SCBWI has meant so much to me over the years, and to have my picture book win its highest honor means the world to me. Lee: In addition to attending #LA14SCBWI - The 2014 SCBWI Summer Conference - to accept your Golden Kite Award, you'll also be on faculty, giving a keynote during the Monday Illustrator Intensive, "Great Artists Steal: Getting the most out of your artistic inspiration." Will that be along the lines of how you were inspired by the work of Alice and Martin Provensen, Mary Blair and Eyvind Earle - and yet created a visual look that's uniquely your own? Peter: You are correct, sir. During the illustrator intensive I’ll discuss some of my artistic heroes, what lessons I’ve learned from them, how I’ve incorporated those lessons into my work, and how the attendees might learn from their own artistic heroes. Lee: It seems like you were trying new techniques and approaches in illustrating "Mr. Tiger Goes Wild." What do you see as the role of experimentation in creating art? Peter: I look forward to the day when I really enjoy and approve of my own art. But so far, that isn’t the case. So I experiment with my art, in the hopes that I’ll stumble upon better ways of doing things. I experiment with color and texture and composition and design and technique. Some experiments work, other don’t, but with each artistic experiment I learn a little more about who I am, and how I want my art to look and feel. I usually need to sit with a finished book for a while before I can decide what I like and don’t like about it. Then I incorporate those lessons into my next book, and I experiment some more. Using this process, I’m slowly learning what I truly want to do with my art. Eventually, when I’m an old man, I hope to finally know myself well enough that I’ll have no need for further experimentation. Lee: Even the pinks of the fish and butterflies and the blues of the water are muted compared to the vibrant orange of Mr. Tiger -- and the sun on the reconciliation/Mr. Tiger returns to the town page. Can you talk about developing the color palette you went with? Peter: In Mr. Tiger Goes Wild, things start off boring, so I designed those early scenes to have a more muted palette. The story gradually gets more exciting as Mr. Tiger acts wilder and wilder, and so I designed the later scenes to be more colorful. It was a pretty straightforward approach. But the color palette also owes a lot to the production of the book. We wanted the book to feel good to the touch, so we printed it on a textured, thick, uncoated paper. Uncoated paper absorbs inks in a way the reduces color saturation and contrast, which had the effect of muting the palette of the entire book. But my publisher and I really wanted Mr. Tiger’s color to pop, to reinforce the idea that he was unique. So we decided to use a fifth ink, for the special orange of Mr. Tiger (and of the sun). We picked a very vibrant orange for Mr. Tiger, and so by comparison, the other colors in the book seem even more subdued. Altogether, a number of factors combined to create the book's color palette, a palette that I hope reflects the concept of the story in an aesthetically pleasing way. Lee: It does! At the end of the book, there's an "about this book" section that explains it was printed "with a fifth color, orange." Can you explain what that means? Peter: Most books are printed using only four colors of ink: cyan, magenta, yellow and black. Printers use the somewhat confusing acronym CMYK, for those four standard inks. Using a “Fifth color” literally means the printers added one extra ink to the printing process. So when Mr. Tiger was being printed, the presses inked each page with the four standard CMYK colors, plus a special orange ink, which was the fifth color. There are thousands of different colored inks to choose from, but we chose a vibrant orange ink to make Mr. Tiger pop off the page. Lee: The endpapers, being gray bricks for the beginning of the book, and a 'wild' field of ferns and flowers for the end, have an arc of their own, and there's a surprise under the paper dustcover. Is this part of a book-design philosophy that every visual aspect of a book is an opportunity? Peter: I want my books to reveal something new with every reading. I mostly try to achieve that goal by incorporating different layers of meaning into the story. However, there are many opportunities to add value to the book itself. My publisher and I felt that Mr. Tiger really leant itself to those kinds of extra details, so I designed a special case cover, and end pages, and we printed with a fifth color on a special uncoated paper. The hope is that these little details added up to enhance the overall experience for my readers. Lee: With all these anthropomorphized animal characters, did you find yourself using visual references or going to the zoo, or is that not so helpful in depicting elephants in sunhats standing upright and wearing lace-edged frocks? Peter: I’ve spent a lifetime drawing animals. When I was seventeen I sent a portfolio to art colleges that consisted almost exclusively of animal drawings. And I've continued drawing animals ever since. So I often don’t need visual reference for animals. However, it never hurts to refresh one's memory, and I did look at some animal books during the design phase of Mr. Tiger Goes Wild. But more important were the books I studied about old London and Victorian era clothing, as I designed the city and the costumes. Lee: When did you first join SCBWI, and can you share how that's helped you on your journey as an illustrator and author/illustrator? Peter: I joined SCBWI in 1999, but my membership lapsed when I spent a year in Europe, so if you look on SCBWI.org it says I joined in 2002. Anyway, in college I focused on children’s books, and developed a number of stories and illustrations, but I had no idea how to actually pursue publication. When I joined SCBWI I felt like I was let in on a secret. I suddenly had all kinds of useful information about editors and agents, and which publishers were looking for what kind of work, and how to approach them. SCBWI gave me the tools with which to take the first real steps toward getting a book deal. Not only was that helpful, it was encouraging. I felt like, if I was smart about it, I might actually be able to get a book deal. My goals seemed attainable. That boost to my optimism made all the difference. Lee: What advice do you have for other illustrators and author/illustrators working on their own picture books? Peter: If you’re reading this you’re already off to a great start. Joining SCBWI is the first thing anyone should do if they’re serious about making children’s books. But aside from that, I think the best thing authors and illustrators can do is learn to think visually. That seems obvious, but you’d be surprised how many authors fill their picture book manuscripts with description, and how many illustrators simply depict what’s already explained in the text. The best picture books don’t rely on words to tell the full story. Authors need to put breathing room in their text, strategically placed gaps in their story that the illustrators can expand with their pictures. And illustrators need to learn how to enhance a story with their art, and not simply reiterate what’s been written. Visual storytelling is not easy, it’s a special art form, but by working conscientiously people can become better at it. I know I’ll be spending the rest of my career honing my skills in visual storytelling. Want to win a copy of Mr. Tiger Goes Wild? Leave a comment on this post in the next 7 days, and we'll randomly choose one winner. To find out more about Peter and his books, visit his website here. And to meet, learn from and cheer Peter on in person, join us for the 2014 SCBWI Summer Conference, August 1-4 in Los Angeles, California. Information and registration are here. 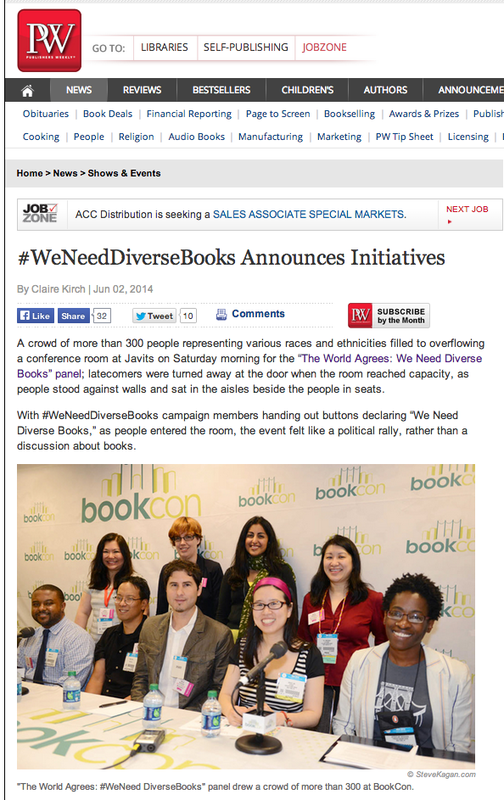 #WeNeedDiverseBooks is "A Call To Arms"
There's been a huge outpouring of #WeNeedDiverseBooks messages on twitter - with over 162 million impressions in just the month of May! The Diversity in the Classroom project of the National Education Association’s Read Across America program and First Book, in collaboration with #WNDB to both promote multicultural books and authors. First Book's pledge to purchase 10,000 copies of each of the multicultural titles it selects for distribution to children in need from low-income families. 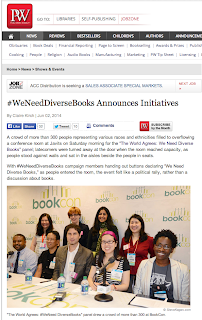 To learn more about the #WeNeedDiverseBooks campaign (and listen to the audiostream of the panel) visit their website here. There will also be a spotlight on diversity at the upcoming SCBWI Summer Conference, August 1-4, 2014 with a main-room panel on Diversity the Friday of the conference, featuring Agent Adriana Dominguez, and Authors Sharon Flake, Lamar Giles, Meg Medina and Linda Sue Park, moderated by Suzanne Morgan Williams. In addition, the conference will once again have the LGBTQ Q&A (which I'll host), a safe space to discuss with conference faculty guests the challenges and opportunities of including LGBTQ characters and themes in our work for children and teens. You can find out more about the conference and register here. 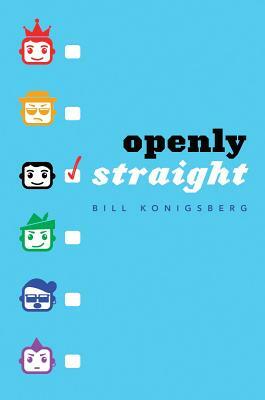 Bill Konigsberg on "Openly Straight" - The 2014 Sid Fleischman Humor Award Interview ...And your chance to WIN a copy! The Sid Fleischman Humor Award is "an award for authors whose work exemplifies the excellence of writing in the genre of humor. The SCBWI established the award to honor humorous work, so often overlooked in children’s literature by other award committees." 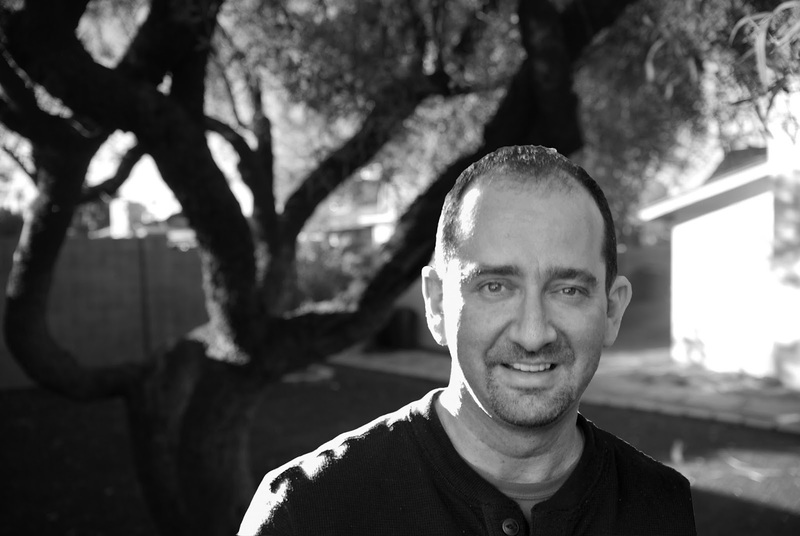 This year's winner was author Bill Konigsberg for his YA novel, "Openly Straight"
Rafe is from Boulder, Colorado. He plays soccer. He hates tofu. He's won skiing prizes. He likes to write. And, oh yeah, he's gay. He's been out since eighth grade, and he isn't teased, and he goes to schools and talks about tolerance and stuff. And while that's important, all he wants is to be a regular guy. Not that gay guy. To have that be a part of who he is, but not the headline, every single time. So when he transfers to an all-boys' boarding school in New England, he decides to become "openly straight" -- not so much going back in the closet as starting over outside it. The transformation works: Rafe revels in a new group of straight guy friends, and the chance to be "just Rafe" at last. But things get complicated when he falls in love with one of his new friends... who doesn't even know that's a possibility. Lee: Hi Bill - congratulations! Please tell us about finding out you'd won the 2014 SCBWI Sid Fleischman Humor Award for "Openly Straight!" Bill: I was in a coffee shop, and when I got the call I jumped up and down like one of those studio audience members on The Price is Right after the announcer calls their name. People winced. Airborne is not the greatest look for a balding, middle-aged guy with a bit of a belly. I was simply so thrilled and honored and blown away. I was also super psyched because now I could throw around the title “Award-Winning Humorist.” This is most useful when I make a joke and it falls flat. I can follow-up with, “. . . said the award-winning humorist.” I should mention that my brother is livid. There is an ongoing battle for the title of “Funniest Konigsberg,” and he was not amused that a book I wrote actually received a humor award. I should also mention that the actual title of “Funniest Konigsberg” probably goes to Woody Allen, whose full name is Allen Konigsberg. Lee: Ha! Well played, sir. The challenge Rafe faces that makes him move to an all-boys boarding school to start over is that in his old high school, he's just seen as "the gay kid." As a writer of teen novels with gay main characters, do you see a similar trap in being seen as "the gay writer?" Bill: Absolutely! Openly Straight is in many ways about my own experience dealing with confining labels, just translated into a high school arena. I call this phenomenon “Gay Fatigue,” which is funnier if you pronounce it French. “Gay fah-tee-gay.” Sometimes you just want to be a person, not a “gay person,” whatever that means. It can feel very limiting to be put in a box with a tidy label like that. And at the same time, the label is there for a reason. It helps describe some of my experience, something that makes me (relatively) unique. It’s surprisingly complicated, and unpacking all these feelings was a very invigorating experience. "Please tell me you're not taking me to your Shambhala Mediation Center place again." One time the previous summer, she got it in her head that I needed more serenity. Serenity is apparently like a great, big fabulous party, except without food or people or talking or fun. She was not amused when I told her afterward that if she'd wanted me to shut up, she could have just stopped by my room and told me to shut up. Do you have different strategies in writing different kinds of funny? Bill: Well first, bless you for thinking that’s funny! Openly Straight is not necessarily a comic novel, but I certainly enjoy writing scenes that I find humorous. As a reader, I enjoy novels that can make me laugh and cry on the same page, so it’s definitely that sort of experience that I set out to write. The great thing about writing a book is that authors can keep all the good stuff and throw out the bad stuff. Meaning that Openly Straight is wittier than I am on a daily basis by far, because all the failed attempts at wit have been deleted. But that also means that I am always working. So many times during the day, I have to write myself an email or dictate on my iPhone a funny turn of phrase that comes to me. I really rely on that, because while there are organically funny things that come to me while writing, just as often the good stuff comes to me while I’m in the shower, or driving. So I’m grateful for the ability to mine that material and use it later. By the way, don’t take your iPhone into the shower. Lee: Is a particular funny moment (like the one above) a product of inspiration, or revision? Bill: I think the funniest moments are moments of inspiration, and those moments CAN’T really be revised. Revision is a valuable tool, but I don’t necessarily think of it as a part of the process where a book gets funnier. In fact, for me it’s just the opposite. In my current work-in-progress, The Porcupine of Truth, there was a scene in a farmer’s market, where a hipster does a Chaucer-inspired slam poem rap about being de-friended on Facebook. I thought this was one of the most clever scenes I’d ever written. My editor agreed it was funny, but in the end, it didn’t move the story along. So it got cut, and rightfully so. It all needs to serve the story, and sometimes we have to kill our darlings. Revision is where funny moments go to die. Lee: "Revision is where funny moments go to die." I think that needs to get needlepointed onto a pillow, somewhere. In our culture, a boy-girl kiss is generally seen as PG, while a boy-boy kiss is seen as R (or certainly PG-13.) How did that impact your writing the scenes where Rafe physically expresses his mutual attraction with another male character? Bill: Openly Straight was the second book I’ve published in which there is a boy-boy kiss scene, and I’d say that I am painfully aware of that double standard. A scene that remains in the novel was called “nearly pornographic” by an early reader in the industry. I don’t think a similar scene with a boy and girl would ever garner such a comment. On the positive side, I think this is all changing rapidly, and that’s a great development. I think we need more kissing in our books. The good kisses teach us how to love one another, and the bad kisses teach us lessons, too. Lee: That's pretty sage of you, Bill. You use the thematic device of Rafe writing self-examination journal entries as homework assignments, and add to it the supportive - and challenging him to deeper self-examination - notes of his teacher, Mr. Scarborough (who is also the faculty advisor to the boarding school's GSA club.) By showing the gay-supportive adults in Rafe's life, do you feel like you're in some ways mentoring your readers as well? Bill: I suppose as an afterthought, I do think that. I mean, I have always wanted to support and mentor young LGBT people, especially those who write. But the reality of writing this book was so much different than that. I found myself in some ways critiquing my own writing in those notes. In the novel, I use the E.L. Doctorow quote, “Writing is an exploration. You start with nothing, and learn as you go.” What I didn’t know was that the exploration wasn’t just Rafe’s—it was my own. Through writing Rafe’s essays, I learned something about writing as a performance, and how that’s different than writing from the heart. That sounds like a simple lesson, but I can definitely say it has impacted me a lot in the last couple years. Lee: Okay, for this next question, I need you to imagine time and space are bendable... Given that you're in a longterm relationship with another man yourself, what would it have meant for you to read "Openly Straight" when you were a teenager? Bill: I’m not a hundred percent sure what you mean with the question. Do you mean, Do I wish I’d been able to read Openly Straight as a teen? If so, the answer is yes. Boy. I wish I had read any number of these LGBT YA titles when I was a teen. I felt so hopeless and alone, and I absolutely felt like no one knew what it was like to be me. To see someone like me reflected in literature would have made a huge difference in my life. I have heard from so many teens that they are Rafe, and they are seeking their Ben. Or they are Ben, and they are seeking their Rafe. I was definitely in that place as a teen, and to have had an opportunity to meet Ben and Rafe between the covers of a book would have been an awesome and empowering experience. Or do you mean, Do I wish I could bend time and space and, as a teen, could read a book by older me, who was now in a longterm relationship? If you mean that, I think that would have been such a life-saving thing for me. I felt at the time like I’d never meet that one special person, because, face it, there weren’t a lot of options at my high school for an out gay kid, as I was. I had no vision for anything outside my own realm. To have been able to know that, 25 or 30 years down the road, I’d be married to a great guy and writing novels for teens? I can hardly imagine what that would have done for me. It would have been like an “It Gets Better” commercial, only with down-the-road proof! I think we should work on a time machine-slash-It Gets Better program to help teens. Let’s get on that. Lee: Lets! When did you first join SCBWI, and can you share how that's helped you on your journey as an author? Bill: I think SCBWI is a great opportunity to commune with other writers and to be part of a writing community. It’s so valuable to me, and it always has been. I joined for the first time when I was writing my first novel, Out of the Pocket, back in about 2005. As an unpublished author, it was useful to travel that path with other aspiring authors. As a published one now, it’s useful to stay connected to others who are engaged in the same type of creative process. I write at a coffee shop where people know me but they don’t KNOW me. Meaning, they don’t know what it’s like to sit down at 8 in the morning, look at a blank screen, and start creating something that’s not existed before. But friends and colleagues from SCBWI definitely do understand, and that is empowering. Lee: In addition to attending #LA14SCBWI - The 2014 SCBWI Summer Conference - to accept your Sid Fleischman Award, you'll also be on faculty, giving the Sunday breakout session "The Seven Deadly Sins Of Young Adult Dialog." Can you tell us more about that workshop? Bill: Ah, the seven deadly sins of young adult dialogue! I am a lover of good dialogue, and hopefully I write some once in a while. What I’ve done is compile some common mistakes—such as “Oldstering,” “Plottishness,” and “Ontopicide”—and I’ve created examples from fake novels by make believe authors to show what NOT to do. At the end, we have an opportunity to try our hand at writing unbelievably bad dialogue. It’s a lot of fun. Lee: That DOES sound fun - and very instructive! What advice do you have for other writers working on their novels for teens? Bill: My best advice is to work hard at your craft, to believe in what you’re doing, and to write the book that only you could write. I’m serious about that. The market is flooded with books that could have been written by anyone. Write something that is, through and through, you. What no one talks about in conference workshops about getting published is that getting published is just the beginning! You’ll need to convince an apathetic world to pay attention to your book. It’s tough work. How does it stand out? Which leads me to my last bit of advice: Write a novel for teens—or any novel, really—because you absolutely have to. If it’s not like drinking water or breathing oxygen, if it’s not that important to you, find something else to do, something normal. I do believe this is the greatest job in the world, but it comes with so many ups and downs! So you have to need it, not just want it, or I promise you’ll turn away when it gets tough. Which it will. That level of desire is truly necessary. If you'd like to hear, learn from, and cheer Bill on as he receives his 2014 Sid Fleischman Humor Award, join us at the upcoming SCBWI Summer Conference, Aug 1-4, 2014, in Los Angeles, California. Would you like to win a free copy of "Openly Straight?" 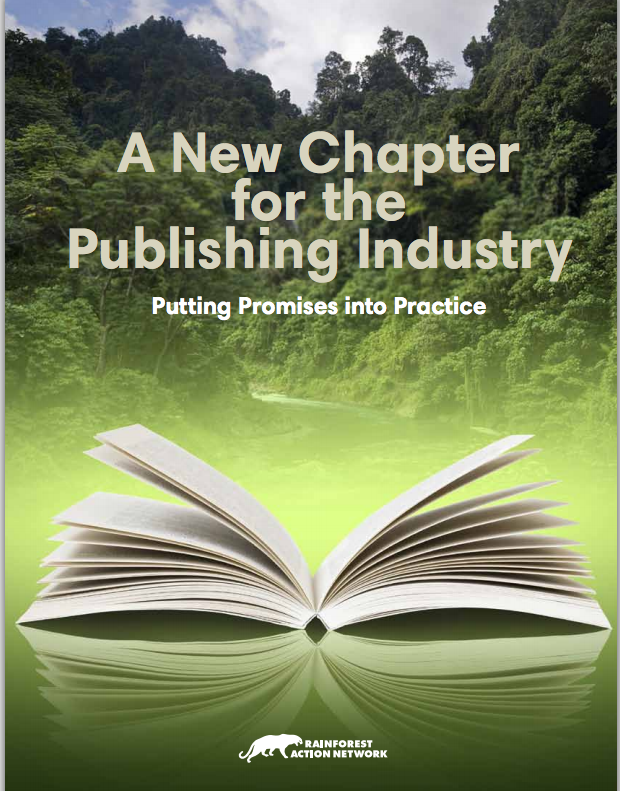 Rainforest Action Network's Report: "A New Chapter for the Publishing Industry"
"...the world's top publishers are moving in the right direction when it comes to eliminating rainforest destruction, human rights violations, and species extinction from their supply chains." Rainforest Action Network's May 14, 2014 report, A New Chapter for the Publishing Industry: Putting Promises Into Practice, outlines the shift in the children's publishing industry over the past four years towards a fuller view of and action on their social and environmental responsibility, and offers a set of best practices to guide companies (publishers and others) in tracing their paper supply chains and protecting forests in the process. In 2010, Rainforest Action Network found that nine of ten top children's book publishers were using paper linked to the clearing and conversion of Indonesia's rainforests in books sold to American consumers. In 2014, they cite Disney, Hachette, Scholastic, HarperCollins, Pearson/Penguin (prior to the merger with Random House) and Macmillan as "Leaders" and say that things are much improved. Eight companies are now conducting independent fiber testing of their books, "to verify that no unwanted fiber is making its way into the supply chain," compared with not a single company four years ago. Nine companies have public paper policies today, compared with five back in 2010. And in 2010, 63% of the books tested contained paper with controversial wood fiber linked to Indonesian rainforest loss and 13% contained mixed tropical hardwood. In 2014, 33% of the samples tested positive for significant percentages of Acacia fiber, and mixed tropical hardwoods were found in only one of 30 samples. The numbers are better, but there's still progress to be made. And while they acknowledge that "publishers alone cannot guarantee the survival of rainforests in Indonesia, the industry has the ability to affect change and create a positive impact." The report is a fascinating education, and is well worth checking out.